Citymax Hotels, the award-winning mid-market hotel brand, today announced the official opening of Citymax Hotel Al Barsha, the latest property to join the group’s expanding portfolio. The new hotel is the first one to effortlessly combine business travel with the charm of a boutique style setting, a statement said. The opening follows the successful launch of Citymax Hotel Ras Al Khaimah in November 2018, and bumps the Citymax portfolio up to five hotels in operation across the GCC, as well as a sixth Citymax Hotel in Aswan, Egypt. 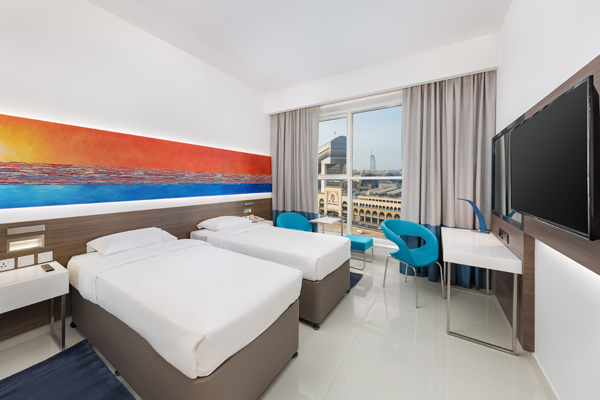 Known for its personality of “vibrant simplicity” and providing its guests with an unforgettable stay, Citymax Hotel Al Barsha will follow in the same steps, but with an added sense of appeal. This Citymax property is uniquely positioned to cater to business travellers looking for the comforts of a well-known brand, but the exclusivity and warmth of a boutique hotel, it said. Citymax Hotel Al Barsha is set alongside its sister property, Citymax Hotel Al Barsha at The Mall. The hotel boasts 120 spacious rooms, including 24 twin rooms and 96 queen rooms. Each floor of the hotel has only 10 rooms, providing a sense of privacy in the heart of bustling ‘New Dubai’. Each room is larger than average and kitted out with a variety of in-room facilities that meet the specific needs of business travellers; workstations with universal sockets and a media hub with Bluetooth capability for wireless audio streaming to the TV makes for efficient work, in the comfort of the hotel room. The property hosts a meeting room, with a capacity of 8-10 delegates. Featuring three unique dining venues, guests are sure to be spoilt for choice. The Stag will be the city’s newest gastro-pub, which is set to launch in the first week of May and will be the latest addition to Citymax Hotel’s diverse F&B portfolio. The cozy, non-smoking venue on the ground floor will serve up delicious pub grub and specialty refreshments. Citycafé, the all-day dining restaurant, offers guests an international menu catering to all palettes and is open from breakfast through to dinner. Lavazza coffee shop is conveniently located on the ground floor within the lobby, serving quick bites, delicious pastries and a variety of refreshments, including specialty teas and coffee 24 hours a day. “The introduction of Citymax Al Barsha is a milestone for both Citymax Hotels and the UAE hospitality sector, as we’re now in a position to offer a niche audience quality accommodation that perfectly suits their business needs, whilst at the same time amplifying the unique warmth of a boutique-style hotel. We’re confident that this new iteration of the Citymax product will become a must-stay option for regional and international travelers, and set the trend for mid-market hospitality offerings,” said Joanne Williams, general manager of Citymax Al Barsha.